So, I was in London yesterday. The day started off with a touch of bloody-mindedness. Before getting the train I stopped in at WH Smith to grab a bottle of water. I selected my favoured bottle (the cheapest one I could find, which was fairly small - good to put in my bag), and went to the checkout to pay. The guy at the checkout, kindly trying to save me some money, advised me that the bottle of water would be £1.49, and I could buy a copy of the Telegraph for £1.40, which came with a free, bigger, bottle of water. b) I don't read the Telegraph. I don't actually have anything against the Telegraph, except that it's a broadsheet i.e. really big when you open it, which is fine at home on a weekend when you can spread it over a large table, but totally useless when you're under some sort of space restriction (like being on a train). The train journey both ways was fine, I got some work done which was good, the meeting in London was useful and interesting (although for some reason there was a toilet roll jammed between two of the legs supporting my table - I never did work out why), and, most importantly, I got to King's Cross station in time to get a burrito. There's a place called Benito's Hat at Kings Cross station in London, I understand that they have a number of places open across central London but I've only ever experienced the one at Kings Cross. The food is absolutely excellent with the burritos being the best I've ever tasted - whenever I see burritos on the menu at places I'm eating I always try them, but they're never as good as the ones at Benito's Hat. 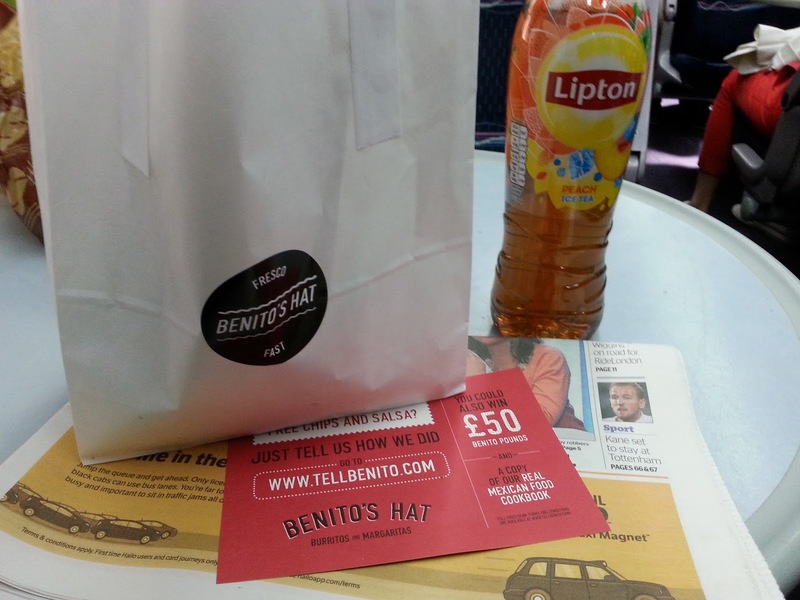 I also got a free bottle of Lipton's iced tea from someone them handing out on the way to the train, so I was very pleased. An excellent way to start a train journey. On the way back, one of the stations stopped at was Selby. Selby is a town roughly in the middle of Yorkshire, situated such that you can probably get to most cities within the county from Selby within an hour. It has some decent shows on at the Town Hall, and I bought a car from Selby. That's pretty much everything I know about the place. Actually, there is one other thing about Selby. At Selby train station, the train drivers stand outside their trains and chat. I don't know why this is so remarkable, but it is. I never see train drivers out of their trains just chatting anywhere else. At smaller stations the trains never stop, and I guess at bigger stations the drivers perhaps have a break room or somewhere that they go when taking a break? I have absolutely no problem with them having a break - indeed I doubt that it is up to them anyway, it'll be that the train has got to Selby (probably from Leeds, stopping at all the little villages on the way), and it isn't due to return towards Leeds for a while. You could have got the telegraph - we could have used it for lighting the fire! Burritos, the sandwich that will take over the world. An encapsulated, delicious mixture of life giving sustenance, and delight. What paper do you read most often? I don't often read a newspaper but when I do I usually choose i - it's a shortish and cheap newspaper that is meant to be relatively unbiased. How about yourself?